The Cotton Gallery at Quarry Bank Mill traces the disruptive impact of cotton during the industrial revolution and how it changed the way we live our lives today. 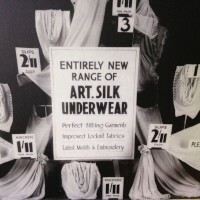 This new exhibition uses items from the M&S Company Archive to tell the story of how revolutionary new materials such as Crimplene, Bri-nylon and Tricel had a huge impact on clothing following World War II. Showcasing a handpicked selection of M&S garments dating from the 1940s to 1990s, the exhibition features previously unseen items which highlights the fabric innovation and scientific techniques which made such clothing possible. From natural fibres to manmade textile innovations, new wonder fabrics were produced to the highest quality and were designed to offer our customers easy-to-wear and easy-to-care for fashions. 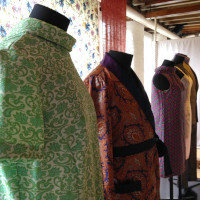 From 1960s lingerie to formal Menswear from the 1980s, visitors will have the opportunity to see and touch the fabrics on display. See if you recognise some of your favourites! Quarry Bank Mill is one of Britain’s greatest industrial heritage sites showing how a complete industrial community lived. Visitors to the Cotton Mill, built in 1784, will experience Europe’s most powerful working waterwheel, alongside original heritage machinery and steam engines. There is also an opportunity to explore the changing programme of exhibitions, take a guided tour of the Apprentice House, visit the stunning gardens or stroll to Styal village, built by the Greg family to house the Mill workers, and still a thriving community today. For information about opening hours and prices visit the Quarry Bank Mill website.